In Genoa, where pesto originated, pesto is made simply by grinding together fresh basil, olive oil, garlic, nuts, and strong country cheese, and is served almost exclusively on pasta. Simply Organic Sweet Basil Pesto Sauce was created to capture the same traditional taste without dragging out the mortar and pestle. 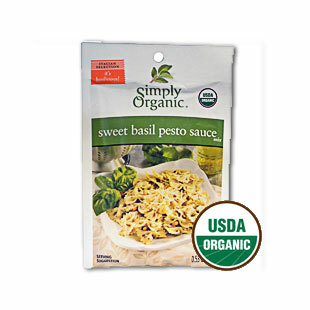 Simply Organic Sweet Basil Pesto Sauce is an instant pesto for dipping and spreading, featuring basil and other organic seasonings.